Korean egg omelette recipe. 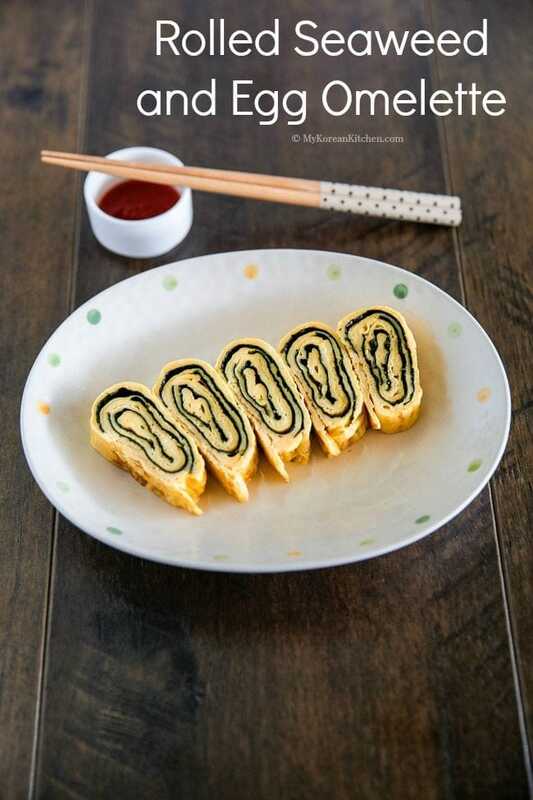 Learn how to make Korean egg roll with seaweed. 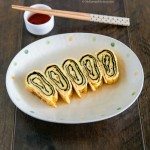 Another thing to note is that making a pretty rolled egg omelette requires a little bit of technique – namely observation, timing and instinct. 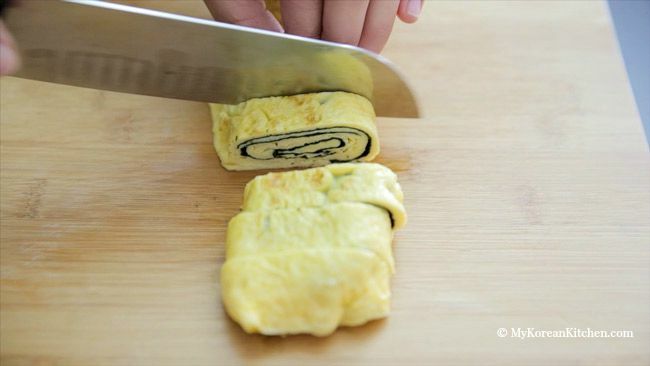 This all refers to the fact that the egg needs to be rolled up at just the right moment. Otherwise it won’t roll well. It can tear or it can burn. Check my video instruction, which will showcase how to make successful rolled egg omelette! I hope you enjoy my recipe! P.S. If you like this recipe, you might also like to try my heart shaped imitation crab omelette recipe! 1 and 1/2 dried seaweed sheets – 1 sheet size is about 19cm x 20.5cm (7.5 inch x 8 inch). 1.Break the eggs in a medium sized mixing bowl and beat the eggs lightly. 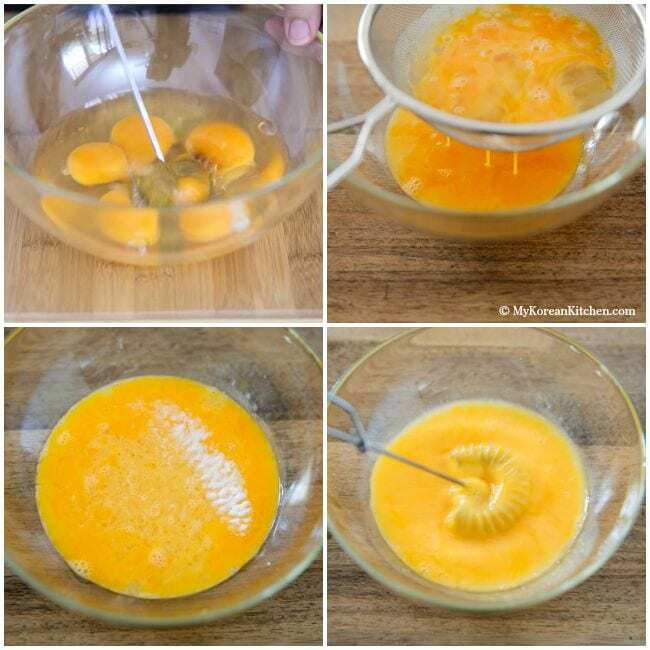 To give a smooth texture, sieve through the eggs into another bowl. Add the rice wine and salt and whisk them well. Move the egg mixture into a measuring cup with a handle so that it’s easier to pour it out. 2. Cut two dried seaweed sheets into half. So you should have four 9.5 cm x 20.5 cm (3.75 inch x 8 inch) seaweed sheets at hand but we will be only using three of these sheets. 3. Heat the pan on medium low heat and add some cooking oil. Spread it throughout the pan. Reduce the heat to low. 4. Pour out a thin layer of egg mixture onto the pan and spread it by tilting the pan. 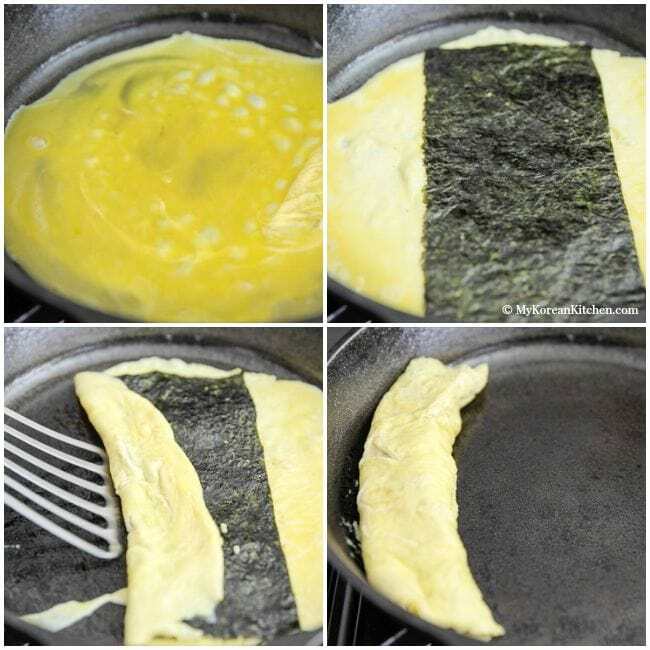 Once the edge of the egg is cooked and the top of the egg is about 80 to 85% cooked, add one seaweed sheet on top of the egg and start rolling the egg with a spatula or chopsticks. 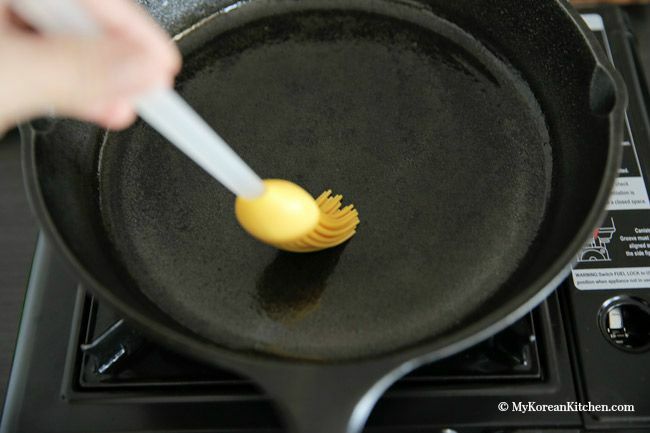 Push aside the rolled egg (to the right) and brush some cooking oil in the empty space (left side of the pan). 6. Take out the rolled egg and cool it down for 5 to 10 mins on a cutting board. Slice it into bite size pieces. Serve. I used a 10.25 inch cast iron skillet. 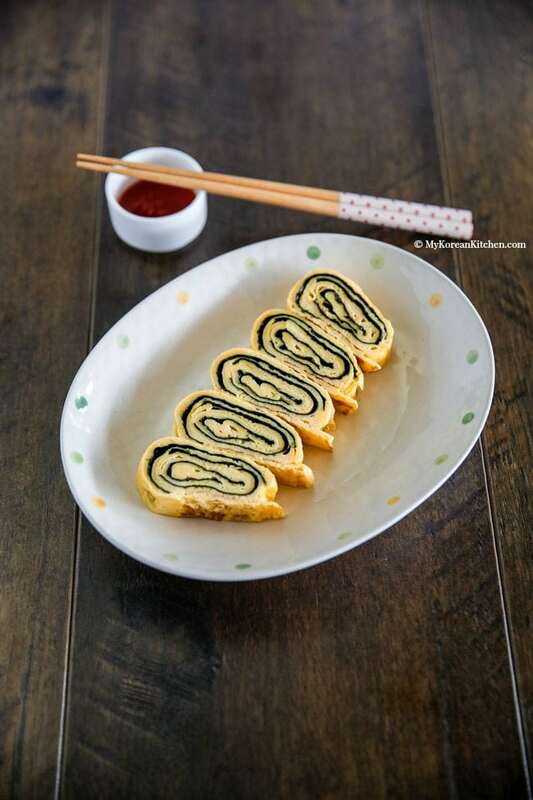 However it is also common to make these egg rolls in a special rectangle tamagoyaki pan, which can make the egg rolls look even prettier. Break the eggs in a medium sized mixing bowl and beat the eggs lightly. To give a smooth texture, sieve through the eggs into another bowl. Add the rice wine and salt and whisk them well. Move the egg mixture into a measuring cup with a handle so that it’s easier to pour it out. 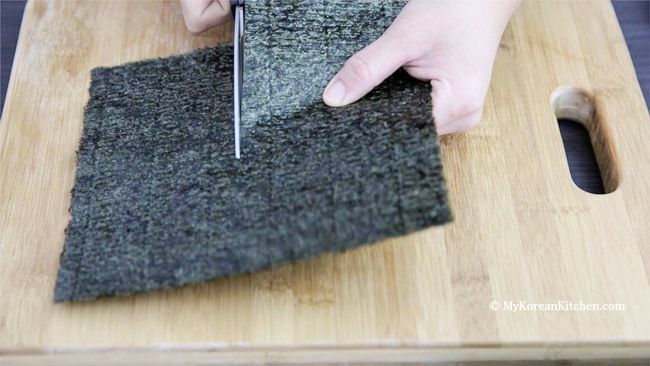 Cut two dried seaweed sheets into half. So you should have four 9.5 cm x 20.5 cm (3.75 inch x 8 inch) seaweed sheets at hand but we will be only using three of these sheets. Heat the pan on medium low heat and add some cooking oil. Spread it throughout the pan. Reduce the heat to low. Pour out a thin layer of egg mixture onto the pan and spread it by tilting the pan. 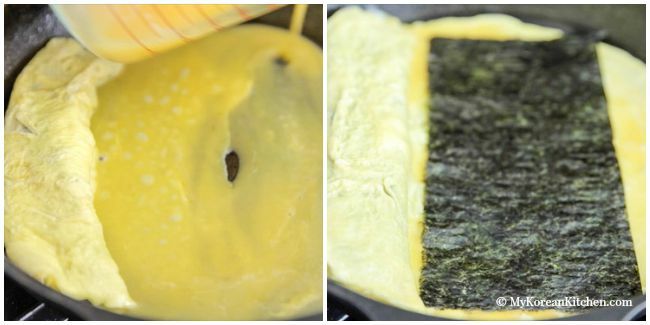 Once the edge of the egg is cooked and the top of the egg is about 80 to 85% cooked, add one seaweed sheet on top of the egg and start rolling the egg with a spatula or chopsticks. Push aside the rolled egg (to the right) and brush some cooking oil in the empty space (left side of the pan). Take out the rolled egg and cool it down for 5 to 10 mins on a cutting board. Slice it into bite size pieces. Serve. What’s the sauce shown on the side? Hi! Great recipe! Is it possible to substitute regular eggs for egg whites, or will it not roll? Incredible! I subbed red wine and 1 drop BetterStevia for the rice wine and absolutely loved this recipe. Gluten, dairy, grain and (almost) sugar free, just the way I need my recipes for combating the Candida. Now on to the Bacon Avocado Cucumber Sushi Roll! Many thanks for your site! Do you need to eat these right away? Or can you make them a day ahead? I’m asking for event planning purposes… Thanks! I’m giving this 5 stars because it looks great! But I’m disclosing that I haven’t made it yet. Hi Barbara, Yes, you can make this a day ahead. Store in the fridge in an air tight container. Enjoy! Thanks for your response, Sue! I made this today and I stand by my 5 star rating. However, I will need to play with heat/oil/rolling technique. The center cooked faster than the edges, which is unusual. I may have had the heat too low or not preheated the pan enough (cast iron pan – I usually cook eggs at a higher heat). I also need to practice rolling so that the finished product is tighter and probably wait until it’s completely cool before cutting. All that being said, it was delicious! This recipe is great and super simple to understand I just have one question, Should the seaweed be roasted before you cooking it with the egg or does it have to be plain? I used sushi seaweed sheets and these types of seaweed sheets are already roasted. So you don’t need to roast them again. Hello , I really loved the recipe, but i cant find rice wine in our super markets, pls advice what can i use instead. Can this dush have a sweet and spicy sauce? Do you have access to Japanese mirin then? They are essentially the same thing. If not, you could try making the rice wine yourself as well. Try mixing the rice vinegar, sugar and water. I can’t give you the precise ratio as I haven’t made one myself yet. It was suggested by my other readers in a different thread. Though I’m hoping to do a recipe for this. 🙂 Let me know how you go! Thank you for sharing this easy and delicious recipe. It was a lifesaver for my last minute decision to cook Korean dinner. My family enjoyed it.